What is sslshopper SSL Checker? sslshopper SSL Checker is an online tool that checks a specified Website to sse if its SSL/TLS certificate is installed correctly or not. Here is the description provided by sslshopper: "This SSL Checker will help you diagnose problems with your SSL certificate installation. You can verify the SSL certificate on your web server to make sure it is correctly installed, valid, trusted and doesn't give any errors to any of your users." 2. Enter the URL of the Website you want to check, for example, www.visa.com. correct intermediate certificates are installed). The certificate was issued by GeoTrust. The certificate will expire in 405 days. 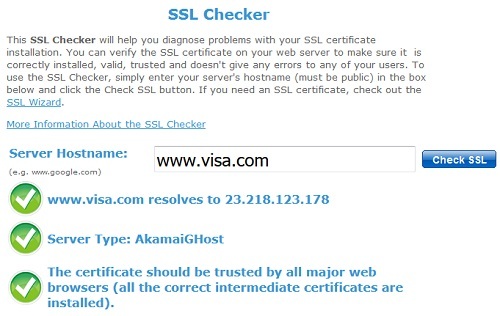 Pass - The hostname (www.visa.com) is correctly listed in the certificate.  2018-05-03 Geo: Nice write up.